You know, in some places women had it rough. When I lived in Oregon and when I lived in Washington and after I come to California, I don’t remember any women dying because of being worked so hard. That must have been way back years and years ago. But we did work hard just the same. I read in this book, that they sent for men to go up in North Port Washington. They sent men from Joplin, Missouri. That’s where my dad was living at the time. My dad went out, and my mother’s oldest brother. She was the oldest, then Uncle Frank. They must of stuck with married men because Uncle Frank was married. I was four years old. My mother’s maiden name was Taylor. She was born Illinois. I don’t know the town? My grandmother Taylor was a Jones before she was married. When I was down at Rubys many years ago, the old lawyer in Alabama found the Indian. He found Jones or Taylor in his big book. He had shelves of them and there was a great big thick book. Why he looked things up for her. Then he died and his son taken over. 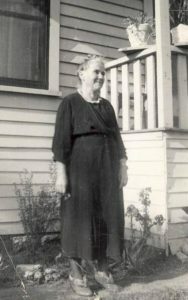 My grandmother, she was Jones that was her parents. My dad had a sister that caused all the trouble between him and my mother. She separated my dad from his first wife, and I think she was trying to do it with my dad and mother. But my mother died. The Lord took her away so she didn’t have put up with that. I could never figure out why his sister had so much influence over him. I thought there was only about two years between them, but then I found out from the family tree that there was six years difference in them. And dad never knew what it was to have a daddy because his dad died before he was born. It was from the civil war I think it was. I dont know if his father fought on the north or the south. My mother was born in Ill. He must have been from there too. My mothers mother, Grandma Taylor said she always remembered how old she was cause she was thirteen when the war started. Thats the only way she could remember her age. She told me a story her husband told her. See he and his brother fought in the war. Evidently one on the south the other on the north. And see they was a fighting all over the fields and everywhere else around the houses. The brothers come around the corncrib both of them had the guns up then they recognized they were brothers and they couldnt shoot each other even if one was on the north and one on the south. Grandma Taylor told me when she was a girl that there was a big battle. And when the guns stopped she went out to the battlefield with her mother to turn over the dead bodies to see if any of them was her brothers. She had seven brothers. I never heard my grandmother speak about any sisters. My mother-in-law Virginia Thompson lived on a boat on the river. One time it was going down the river and it broke loose and her husband was gone and a man said “you get off this thing”. He says “dont worry your husband will follow you, you just get away from this thing” and she did. She went home and he followed. She said that she got sick on the boat. That some way or another it didn’t agree with her. She was never a big woman anyway she wasn’t but ninety pounds. She had to get off of the water she said they lived on that for about three years. Some kind of business he was doing. Buying and selling odds and ends. Paul remembers his grandma Thompson telling him that once when she was a little girl going home, a panther was following her. She got to the corner of her home and she seen the thing then she ran up the to house. And it turned around and went away. He thought it was when she was a little kid living in what West Virginia. I said, No! Not West Virginia. She was brought up in old Virginia. So was my dad – in Morgan County. My mother-laws maiden name was Bishop. I know they lived way out in the country. Thats what my Aunt Minnie told me. Her name wasn’t Minnie but that was her nickname. My dad was the youngest in his family. I think there was four girls and two boys. His father was killed during the Civil War. Before he was born. Was it on the south side? Oh yeah, it bound to been on the south side because he was born in Virginia. Old Virginia. So that’s the south. My grandmother Taylor had asthma. The doctor got her chewing tobacco when she was nine years old because of it. Then she just kept on chewing until it was the end of her life. My dad’s mother was a Bishop before she was ever married. It was the Pennsylvania Dutch. People came – I know it’s in some history books – there was some kind of trouble in Holland and the people came to Pennsylvania and settled there. Some war or something – I don’t know what it was. And that’s the reason they call them the Pennsylvania Dutch. I’ve got a book, it’s kind of small print, that tells quite a bit about that. About people coming there from Holland. I guess I could read it with a magnifying glass. The Scotch come in on my mother’s side. The Bishops was on my dad’s side. It must have been my grandmother Taylor’s which would be my mother’s mother. We’ve got Scotch, Irish, Dutch, English, and Cherokee Indian. Cherokee Indian comes from my mother’s side. My Dad to come out from Joplin, Missouri to North Point Washington. And in one of these books I found out why. Isn’t that something? There was up around – all through Stevens County was in real good shape then. That was 1902, must of been. So I found in this book that they sent for a whole carload of men from Joplin, Missouri. I remember hearing my Dad and Mom and them talking about things like that. My mother always told me she says, Keep your ears and your eyes open and your mouth closed and you’ll learn a lot, and I did. Hearing them talking. I wondered for a long time – I never thought about asking and I knew that they came out but I didn’t know why or how because when he came out they must of been just taking the married men, evidently at that time. This is because my mother’s the oldest of her family – My grandmother Taylor, she had four children, my mother was the oldest then her brother Frank was next and he was married at the time. And he came out the same time my dad did. wondered about the families. But it could of been that the company paid – and the men worked long enough, you know, to have something come in. afterwards for sending for their families, I don’t know about that. But it was kind of odd in a way that all these years I never thought about asking my dad about it. Just too busy with my family, I guess. I told Dorothy, I says well looky there God answers prayers, even for finding that book that told things that I been wondering about for years. given freedom. If they wanted to go they could, but if they stayed with him it must have been because he was so good to them. And I understand they stayed. Well my Dad’s side was from old Virginia. Tennessee, yeah, that’s where my grandmother Taylor was and her family. It was the state of Tennessee. I think they lived out on a farm. You know some of those people that were relatives did have farms. Many years ago, why, they even had slaves. My mother’s grandmother on her mother’s side was a little tiny woman. She was kind of dark. She was a little tiny thing. But that would be my grandmother’s mother. Yeah, my grandmother Taylor on my mother’s side. But she’d be the one that married a Berry. One thing, Berry was so well to do and wanted to take my mother and send her to school and educated her. Indian coming from out of my Mother’s side. My son Paul says there’s a real skill to being a sawer. When he was up in the woods in the timber, they still used sawers. They had a special craft. They were skilled men that sawed. And they could look at that timber and tell how many boards they’re gonna get outta it. My dad worked right in the sawmill. He was in there running the thing that sawed the logs and made lumber out of it. Paul told me they put sawers in a little cage. Because the work was so dangerous. But in the mill that him and Charley had, why he wasn’t in any cage. Well maybe later on they put them in cages – The saw band use to break and then it was real dangerous. But probably the one dad was running was all controlled by steam. But actually I couldn’t tell you what it was run by. My brother Everett told me he was in with Charley. Everett said that down by Covelle that he had a mill of his own. He had a little mill of his own at Covelle, Washington. on my Dad’s homestead. It didn’t look very big or very long in the sky. But according to what they said on the TV it was miles long and miles around. It looked like a ball of fire and a long tail. It wasn’t like you see a fire, you know, really burning in a stove or something like that but it was more of a light orange color in the sky. It was nineteen and ten when I saw that. Well, it’s supposed to be 76 years ago and that would be right. cows bringing our cows in. sleep. Last words she said. Keep all the children together. His name was James Jackson Lee but he went by the name of Lee. for him to keep the family together. then we’d have to go get them. We’d ride our horses up. jump over that log. Frank got down to go over and see what was wrong. so he had to quit trying to have a dog. When he was growing up he always wanted a dog. He told me a drunk Indian give him this dog. It was a spotted dog. It was a white dog with black spots on it. I remember we headed over to McClintons- Frank and I was coming back from there one time. That’s when the McClintons were neighbors. laid it on the fence. was on the other side over there with the cows. tried to starve us out. I heard that from a girl that was living there with her dad. me. Sometimes Everett was with us. My mother was still alive when we got lost and the horses led us back home. We never found the cows. Mother never scolded us – or anything. Course the cows use to come in by themselves. Dad liked to trade. Though never seem like he’d get a good trade if he traded anything. Seemed like he got the worst end of it. He traded something for this great big o’l cow. while she was chewing her cud. You could milk her on either side. one way or she’d kick your bucket all over. One time when we was riding the horses, a neighbor told us theres panther up on the hill. thing screaming it would send chills straight through you. little bit on the back of that saddle she’d start to bucking. afraid. That was after it was getting dark. My dad — he just couldn’t kill anything. He couldn’t even kill a chicken. come out and he shot the snake. One time there was a rattlesnake and he shot it. But he wouldn’t even kill a chicken. My mother always had to kill the chickens. have nothing to do with killing. I got a picture of the tree that fell down that was 1909 in the storm. older brother because he was a bully. I told Aunt Maggie Uncle Bobs wife, I told her that one time. “Oh Ross? move it. But finally he give up. 17 then. Now Frank was always kind to animals. He had one little buckskin. I use to ride her. up there. I don’t know how long he had it. either cause I guess there wasn’t enough people there to pay a pastor. think she rode in there on a horse. mother even made her own bread. I like bread. We had cornbread too. how. Finally she did with a gentle cow we had. taught me how to milk. I begged her to let me sew on the sewing machine. going to let me have that kind of a time. then. So I never did learn to swim. her to get out because she’d began to get blue, you know. Waters cold. But it didn’t scare her a bit. fool along there just as long as I wanted to. I had to do it over a couple of times or three times I usually learnt. her children. In her heart she must have really loved the Lord. and dont care. The cemetery is right on the bank of the Columbia River. determined that my mother wasn’t going to be buried there. to drive with horse and buggy. guess it would be down there in Oklahoma. might be on in Indian Affairs if they keep a record of that far back. she went back up there. It’s a small town. Everett a bath and also be sure you put clean clothes on him. I did. have come down on him with that chair. current you know. We went clear across the river. brother Ross – Roscoe they were working down there. think I got out of my mouth when she hit me. And I was holding the baby. Dad grabbed the baby up. hadn’t had the baby why that chair would have come down on his head. was just two years older than I was. Mable up with him. But there was Geneva and Everett. a lazy bone in her body. Oh boy! times and didnt have any more. about the same age as Mable. I stayed with them. together because they lived too far apart. Frank and me were up there on the homestead and we use to ride all over. down and there was the Columbia river and real steep, rocky cliffs. they knew about the log. no we’re not lost. Finally, he admitted that we were lost. I was about 13 when I went down to California. A lot of people had cars. he had a wagon and he had a buggy. brother and sister. So he could get train passes for us. But he was a fellow who seemed like he couldn’t stay on one job for very long. house for us to live in. living. I guess my brother Frank was still with them. old, I guess. That’s when seen my grandmother again. All of a sudden everybody left and I was left there alone. up there but I wouldn’t. was so careful about him. She wouldn’t let a speck of dirt get on him. you know. I knew her to change the three-year-old at least three times a day. overalls on him and let him go out and play in the dirt. there and let him play in the dirt. Other children would come along. After they left I answered another ad where they wanted a maid. suppose to be. It had a bathroom, toilet and bath in it and bedroom. That’s where I stayed at first. I don’t remember exactly how long. want that to get around this 400 club, you know. months I think it was. going to be cut through. take up a timber claim and teach in the country schools. got over it. Maybe he learned it from his wife or somebody. they called the rag then and you wiggle your body as you’re dancing. some ladies over there were complaining about the way we were dancing. Well that’s the first time I ever remember dancing like that. know. You know how they dance now days? Have you seen them? with that bear. Some of them just figured they’d take the bear you know. real good name. Everybody in the typewriter business knew him. the daylights out of me and I got to thinking about it the next morning. that. I’m so glad it did frighten me. People make mistakes like that. They try to booze all their troubles away. me out, you know, when I was operated on. It just takes so quick though. brush. Scrub scrub scrub – up and down – up and down. Spokane bought it. They built a nice house. Roy was saved after our little girl died. I recall him going to church before that. six years and six months. They went in on Friday night and Ruth died Sunday afternoon. body? – That’s the way I was approached. away. Then he went to the Baptist church. there. You always had to drive a buggy or wagon. little ford car. He was living miles from a town by the name of Alton. It’s on the map. They brought the mail out to my uncle. on the border of Arkansas. San Diego before we went to Los Angeles. of office machinery. We didn’t live far from the ocean. that much about my mother. Mother wanted me to be a girl so bad that my interest was inside the house, you know, helping her. Geneva was a tomboy. 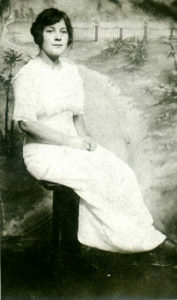 I got married September 1914. We eloped. Roys mother knew that we were going to, but the rest of the family didn’t. We were suppose to go up to Enterprise to see if he could get a job. We were there about two years. We lived in West Virginia for six years. First in Coalfield and then in Bloomfield. When we left for California, we stopped first and picked up Mable. It was cold in West Virginia. It was January when we went to Coalfield. Ohh so cold! I couldn’t get a fire going! Just had a small cookstove for eating. I never was good about building a fire using coal. You have to have kennel [kindling], kennel wood. old baby, Ruth the oldest one. Roy didnt scold me or say arent you ashamed of yourself. He was so kind and sweet. He got the coal can and walks I dont know how far it was  might have been a half a mile might not of. He got the coal oil so he could get a fire started. I wanted to go back. If I waited one more day I wouldn’t have been able to cause a storm blew in. There was just a small train that run from Enterprise down to Le Grand. Then you had to get another train if you were going anywhere else. We had an awful fire. I had the flu a month after Dorothy was born. It always settles in the weakest part of you when youre sick. Naturally after childbirth it would be the female organs. The doctor come in one day and said  arent you the lady that didnt want any more children? I says I got three little girls at home and I want three little boys. I only got one. Paul  had seven girls and one boy. I had just got out of bed for the first time after I got home from the hospital and the doctor told my husband not to leave me alone. Of course he had to go to his job. So he hired a lady that wasn’t too bright. And if Hazel had been home, well, she was always bad about getting a hold of matches,  just loved to get matches from those old style match boxes. She’d just strike one and watch it burn. She would have been the one to be accused of the fire, but her grandma Thompson took her home with her. And we burnt coal near the house. There must have been near a quarter ton of it. Plus there was a pile of pine pitch for starting the fire. Inside the house we had straw beds. They were in something like pillow cases. When the children wet the beds the straw could be taken out and case washed and new straw put back in. Well, it was Ruth that got a hold of the matches. Shes the one that started the fire. I went out with the hired lady to get water and the lady said  Mrs. Thompson so you know your house is on fire? I went and looked and had this spell. I was having convulsions then. The people next door had a phone and called Roy. They said Mr. Thompson your house is on fire. He said, the hell with the fire, where are my wife and kids!? He told me he didnt know how he got there so quick. Ruth run out of the house. But Dorothy was a toddler and she walked out with flames coming up over her  flames as she trotted out the door. To think Ruth escaped the fire only to die of diphtheria in San Diego a year later.